The hall is just off the main road, opposite the Bull Hotel. 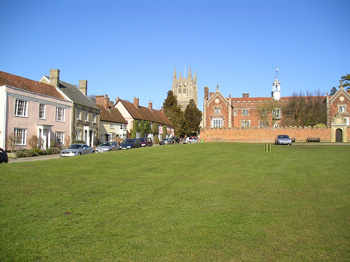 Long Melford is 3 miles from Sudbury, 14 miles from Bury St. Edmunds, 18 miles from Colchester and 44 miles from Cambridge. There is a good size free car park at the hall. If, as occasionally happens, that is full, it is possible to park on the main road. 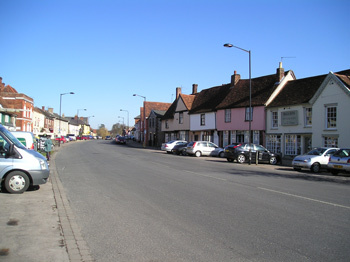 Long Melford became part of the Missing Book Fair stable in April 2010, but there have been book fairs at this venue for over 30 years. In fact it is probably the longest running book fair in East Anglia. Whilst fortunes have varied over the years it is now firmly on the up and up. Each fair features 26 dealers who, between them, offer a wide range of books. Whilst Long Melford has long been known as a centre for Antique shops, it now also boasts a number of art galleries and fashion shops. Should you have time after visiting the book fair there are also three major architectural attractions in the village - the imposing church of Holy Trinity, Melford Hall and Kentwell Hall (see our Links page for more information). The fair has a well deserved reputation for good homemade refreshments. There are also several pubs in the village within easy walking distance.